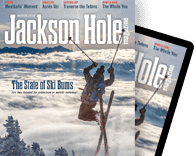 Geologically speaking, the Gros Ventre Range seems built to slide. 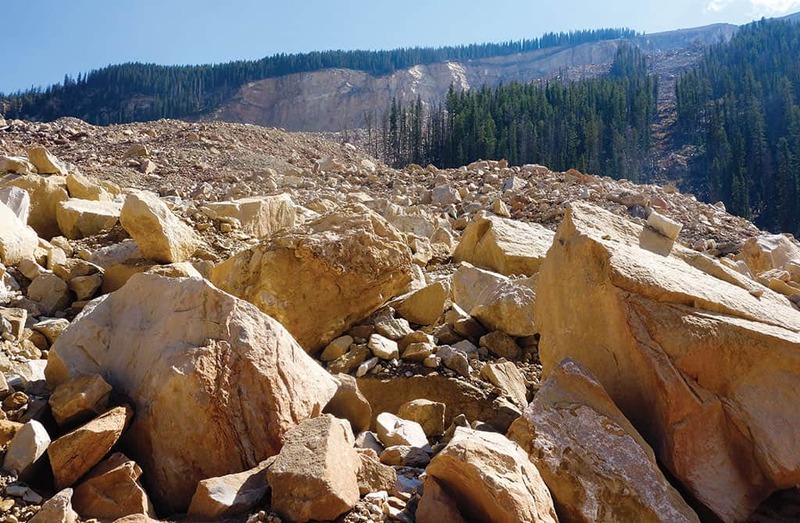 Less than a decade ago, a small landslide on Crystal Peak began to increase in size. 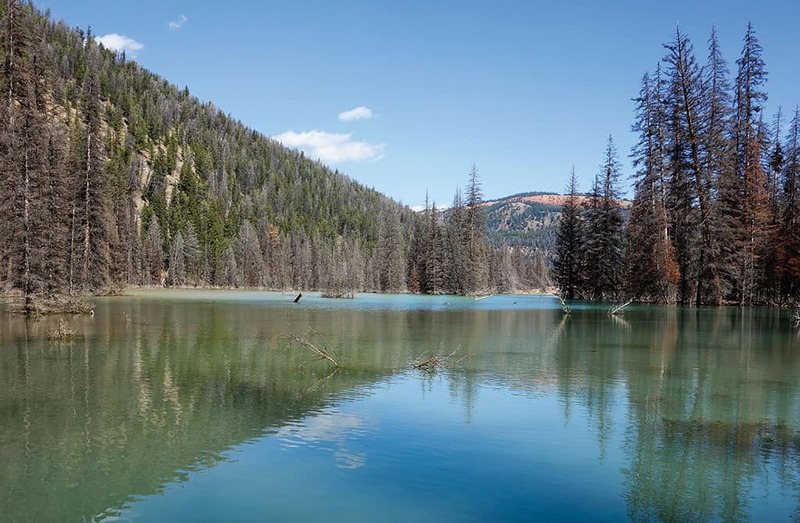 In the years since, it has swallowed up meadows and partially dammed Crystal Creek, creating a new lake, Crystal Lake. The area pictured above was a grassy meadow as recently as 2008. In 2007, an old, inconsequential landslide near the top of 10,972-foot Crystal Peak suddenly became very consequential. Over the next several years, like a metastatic tumor, it grew and grew from its original site until half the mountainside peeled away, sending truck-size boulders, silt, dirt, mud, pine and aspen trees—and anything in their way—down to the formerly bucolic valley floor. This view of the landslide is a five-mile hike from the Crystal Creek Trailhead. I took dozens of photos before reluctantly turning away from the slide to continue on the Jagg Creek Trail to the Six Lakes, our chosen destination for the day. (FYI, we only found five lakes.) I vowed to soon return for the express purpose of visiting this awesome landslide. Less than three weeks later I headed back, dragging along a girlfriend who was more than slightly dubious about my enthusiasm over a landslide. But as soon as it popped into view—and it was still a mile or so away at this point—Kelly’s doubt faded, and she was as awed as I was initially. Crystal Lake, formed in 2011, isn’t yet on topo maps. 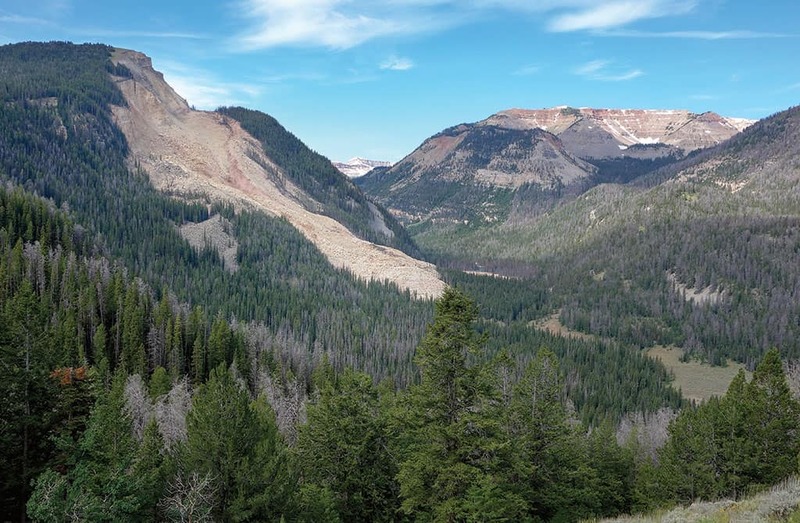 “THIS LANDSLIDE, AND how it’s transforming the landscape around it, is one of the coolest things I’ve ever seen,” says Farris, who has worked for the Forest Service since 2000. “What used to be a meadow is now moonscape and a lake. When do you get to see a lake form? It wasn’t Farris who discovered the new landslide. That was Gap Pucci, a longtime outfitter operating in the area. In 2007, Pucci called BTNF’s Jackson District offices. “Hey there, I tried to get my horses up to the camp, and I can’t get there. You might want to check Crystal Creek out,” he reported. The following week, Jessica Shaw, lead wilderness ranger for BTNF’s Jackson Ranger District, went in to investigate. She and a friend camped near the slide. “We weren’t sure how far exactly we were from it, but we felt we were far enough to be safe. Still, we heard boulders coming down all night,” Shaw recalls. “They would echo through the valley. It was kind of eerie but also exciting.” And it was the end of the line. Pucci wasn’t exaggerating. The trail was impassable. It was the trail crew’s turn to go in. “IT’S KIND OF a funny story,” Farris says. He and his crew camped in the meadow that’s now a moonscape and heard the same symphony of rock fall that Shaw had. They found the nose of the landslide that had buried the Crystal Creek Trail, just as Pucci described. “We did a little re-route that was maybe one-quarter of a mile and thought we were done,” Farris says. “Then I thought I should probably just check up the trail a bit. I came around the corner and there was a wall about thirty feet tall of house-size boulders and old-growth trees.” Farris walked back to his crew. “Um, we’re going to have to find some more funding. This is going to be a bigger re-route than we thought.” Where this debris had hit the valley floor, the ground rippled, buckled, and split apart. “It’s amazing to think of the amount of force that must have been behind it to create an impact like that,” Shaw says. That was 2007. In spring of 2008, Farris got reports of Crystal Creek running red at the Red Rock Ranch, five miles downstream of the slide. Since the creek is usually a glacial green, this indicated more slide activity. 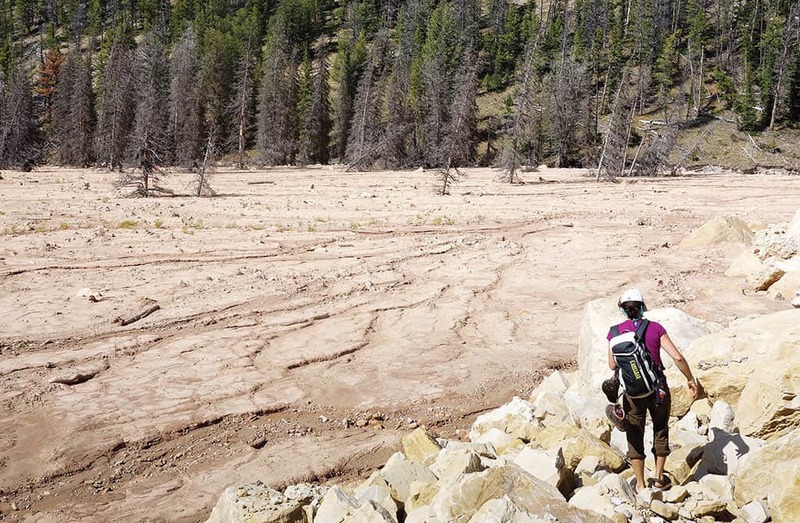 “I went on a heli flight up there, and we discovered that basically a drainage had formed from up top and pushed a crazy amount of silt all the way down and created this alluvial fan kind of thing,” Farris says. The alluvial fan is what turned Farris’ meadow into moonscape. Also, “When that silt came down, it pushed Crystal Creek all the way to the other side of the drainage. It got taken completely out of its bed and started flowing through the forest,” he says. Farris’ decision to put the trail high was prescient: the next summer, additional debris pinched the creek across from the alluvial fan. A lake began to form. Car-size boulders create a border between the moonscape and the debris field. It is not recommended to walk on the debris field. WHEN WE HEADED there, Kelly and I found that Farris’ new trail was still perfectly fine, albeit tough hiking. It was, by far, the biggest vertical climb of the day but still only a couple hundred feet. The first five-ish miles of the trail—flat or gently undulating along the banks of Crystal Creek—spoiled us. But we didn’t notice the new climb too much. At that point, the former meadow, denuded of all signs of life, was just off to our left. Crystal Creek raged directly below us, tearing through its new channel, which is really a crumbly trough choked with deadfall. And then there was what has come to be named Crystal Lake. Mature trees, many still bearing boughs and needles, placidly endure in the middle of its turquoise waters. I wondered for how many more years they could cling to life. Looking for the southwestern end of the lake, where it again becomes a creek, we followed the new trail and the landslide disappeared behind us. It took about ten minutes before the trail began to descend back to the valley floor. We bushwhacked the twenty feet from the trail to the lake’s inlet. We used a fallen tree to leap onto the pebbled bank of the creek, which at this point is shallow and flows lethargically. We crossed to its western side and began backtracking in the direction of the moonscape. The bushwhacking wasn’t easy. We struggled through knee-deep, boggy areas growing algae a shade of Technicolor green I had never before seen. Eventually, though, we emerged onto the siltscape. Although it was “quicksandish” when Farris first saw it in 2008, it’s now nearly petrified. Across the valley, the Tetons are growing an infinitesimal amount each year. I guess that’s kind of exciting, too. To get to the trailhead, just north of Kelly turn onto Gros Ventre Rd. from Antelope Flats Rd. This road is paved for a short time and then becomes dirt. Head east on Gros Ventre Rd., past the Gros Ventre Landslide National Geologic Area, Lower Slide Lake, and the Red Hills and Crystal Creek campgrounds. About ten miles down Gros Ventre Rd., start looking to your right for signs for the Red Rock Ranch and Forest Service Rd. 30377. Turn right onto this road. Passenger cars can handle it until the turnoff for the Red Rock Ranch. After that, it gets rocky enough that if your car doesn’t have high clearance, you might want to walk. At the Red Rock Ranch, there is an intimidating sign that says “End of road. Red Rock Ranch not open to public.” It looks like this sign references all land past the sign, but it does not. FS30377 does indeed continue on to the left. The trailhead is about fifty minutes from downtown Jackson. The most difficult part of the hike is at the beginning: crossing Crystal Creek. This should not be attempted until at least mid-July. There is no bridge across the creek, and it flows fast and strong here. BTNF ranger Jessica Shaw urges walking downstream a couple of hundred feet to cross. “There’s a spot that’s significantly shallower there and has some rock bars. Crossing at the actual trailhead on foot is treacherous,” she says. “Wherever you cross, I recommend having good creek shoes and hiking poles.” Expect a second, much mellower creek crossing that brings you back to the northeast side of Crystal Creek about 1.5 miles up the trail. There is a nonmaintained trail that side-hills across a steep, loose hillside several hundred feet above Crystal Creek that keeps you on the northeast side of the creek and allows you to avoid both creek crossings. Do not attempt this option if you have any issues with exposure or heights. If you slip on this trail, it could be catastrophic. If you’re comfortable in your hiking abilities and with heights, look for this trail at the east end of the parking lot. By going this route, you will bypass the first two-ish miles of the official trail. Once you’re into the open meadow beyond the two creek crossings (or the loose, nonmaintained trail option), the hiking is easy and beautiful. The landslide will come into view about two miles on, before the intersection of the Crystal Creek Trail with the Jagg Creek Trail.